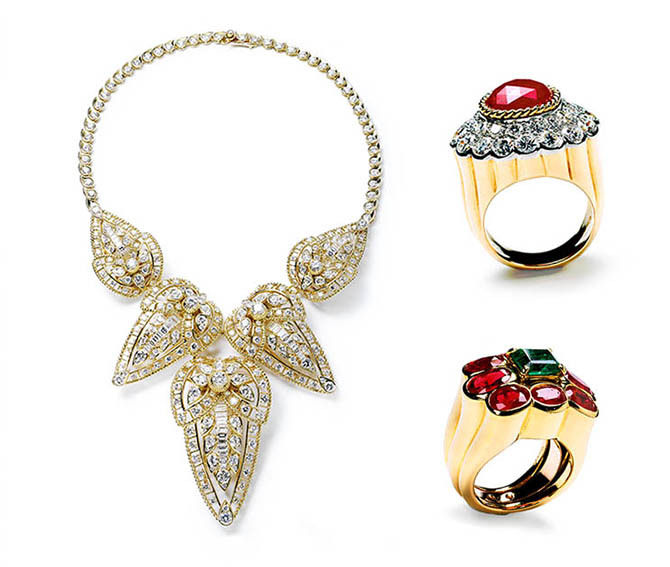 The Academy Awards are known as the Super Bowl of fine jewelry. This year the show completely lived up to that reputation and then some. There were stunning necklaces, dazzling earrings, amazing bracelets and a tiara. 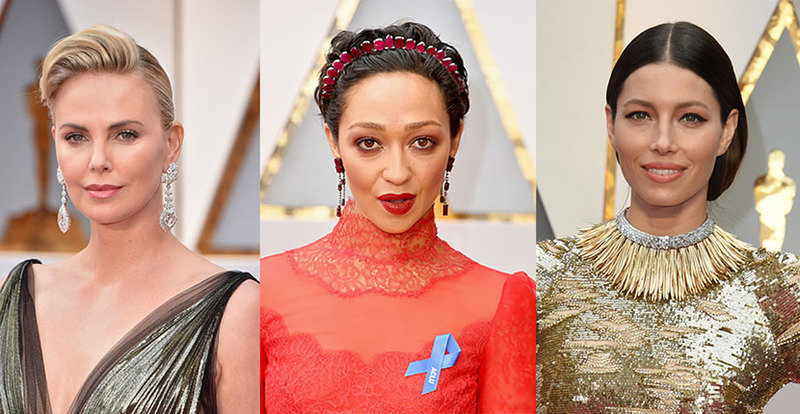 Not only did the stars shine in jewels they also showed their support of several causes including the ACLU, Planned Parenthood, GLAAD and the Elizabeth Taylor AIDS Foundation. 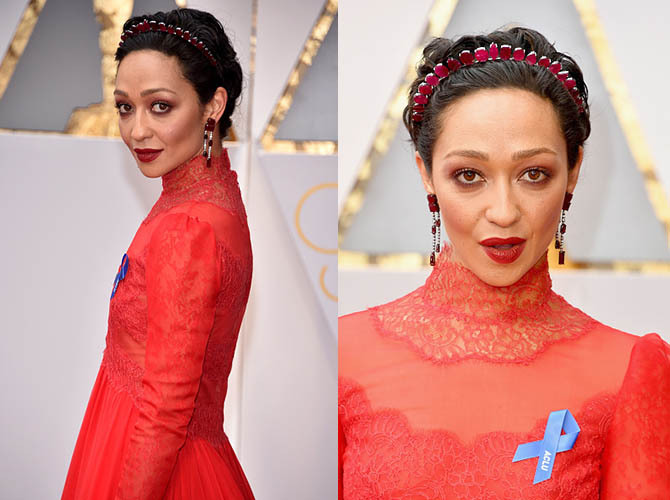 Ruth Negga stunned on the red carpet in a red Valentino gown and custom made tiara, earrings and ring by Irene Neuwirth featuring Gemfields responsibly sourced Mozambican rubies. The headpiece features 146.16-carats of rubies and the earrings are set with 37.18-carats of rubies and 3.26-carats of diamonds. The Loving star whose stylist is Karla Welch also had on a ring set with a 14.89-carat ruby set in a frame of diamonds. The coordinated suite of jewels are all set in blackened white gold. A blue ribbon in support of the ACLU was stood out on Negga’s gorgeous red ensemble. Emma Stone, the best actress winner for her role in La La Land, paired her gold Givenchy gown with earrings from Tiffany’s Whispers of the Rainforest collection composed of diamonds, gold and platinum. She also sported a Planned Parenthood pin at the bottom of the strap of her gown in support of the organization. Charlize Theron’s dazzling jewels were some of the largest pendant earrings I have ever seen on the Oscar red carpet or anywhere. They came from Chopard’s Garden of Kalahari collection. Jessica Biel put on one of Tiffany’s exceptional necklaces from the Blue Book collection that debuted just a few short weeks ago. 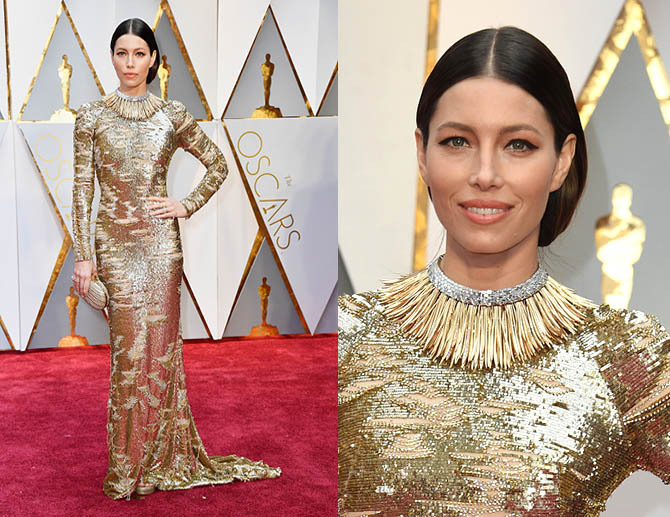 The Whispers of the Rain Forest piece she wore with her gold Kaufman Franco gown features 200 baguette diamonds in a choker and over 350 uniquely shaped gold fronds. 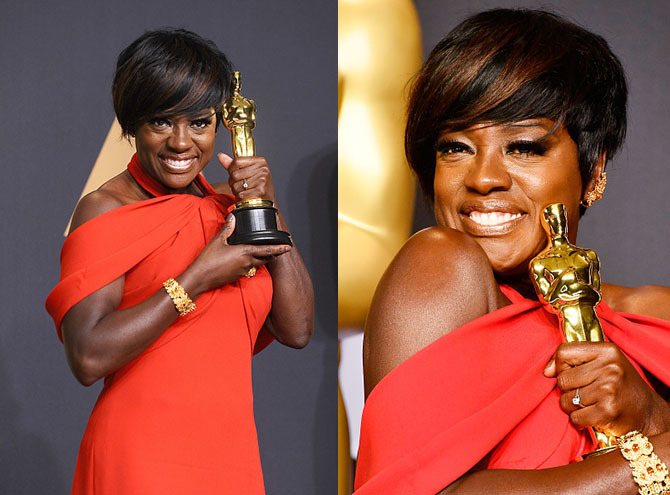 Viola Davis wore an amazing ear climber and bracelet from Niwaka. Dakota Johnson put on a vintage statement necklace by Cartier. The elaborate gold and diamond design made around 1958 lit up the satin on her Gucci gown. 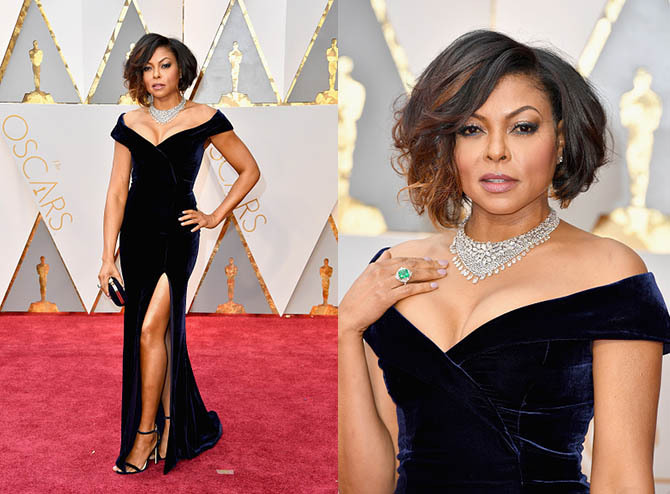 Taraji P. Henson looked sensational in a bib necklace from Nirav Modi’s Luminance Collection and Evergreen emerald and diamond ring from Indian jewelry designer. 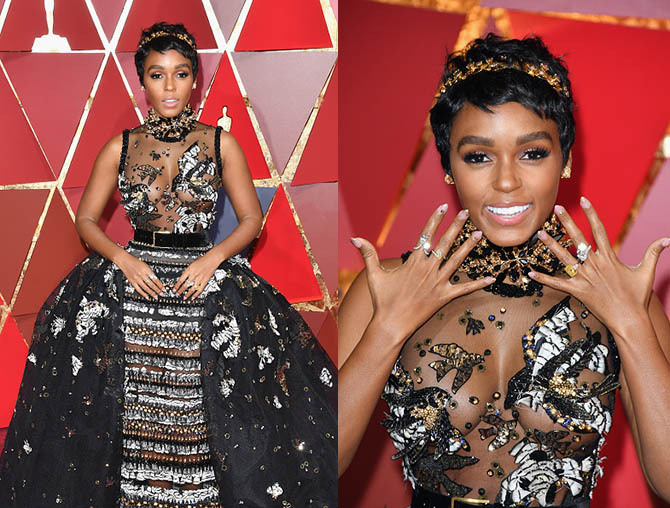 Janelle Monae sparkled in diamond jewels from Forevermark and a costume crown from Jennifer Behr along with her extraordinary Ellie Saab gown. 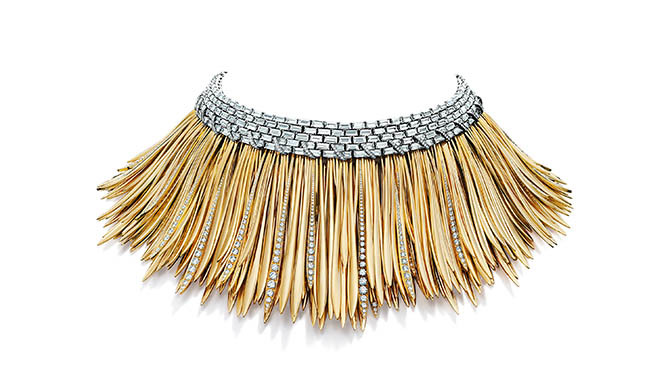 Nicole Kidman’s gorgeous jewels came from Harry Winston. Her selection of jewels included earrings Winston Cluster Diamond and 30.60-carat spinel earrings set in platinum and 18K gold, a vintage Winston bracelet made in 1963 set with 44.03-carats of diamonds set in platinum and a Splash diamond bracelet set with 31.59-carats set in platinum. Her third bracelet was a actually a vintage Omega Secret timepiece covered in diamonds. Scarlett Johansson put on several vintage jewels from Fred Leighton including a pair of diamond, platinum and palladium three row cuffs by Belperron. Among her own designs in her multiple ear piercings, she wore a 1930s pear shape diamond earrings by Belperron. Halle Berry wore any number of jewels set with Forevermark diamonds. Her pieces included a Two Finger Diamond Ring set in 18k White and Rose Gold, bangles by Jade Trau, Natalie K. Her drop earrings are by Pluczenik. Model Karlie Kloss also looked spectacular in Nirav Modi jewels. She also pinned an ACLU ribbon to her hip.